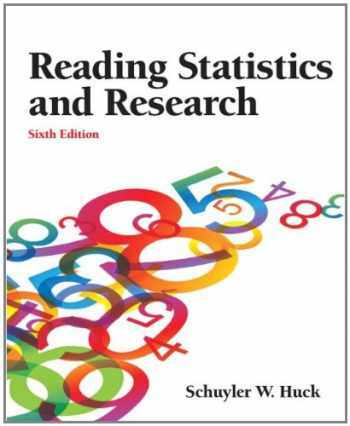 Acknowledged author Schuyler W. Huck wrote Reading Statistics and Research (6th Edition) comprising 592 pages back in 2011. Textbook and etextbook are published under ISBN 013217863X and 9780132178631. Since then Reading Statistics and Research (6th Edition) textbook received total rating of 3.5 stars and was available to sell back to BooksRun online for the top buyback price of $61.72 or rent at the marketplace. Employing a non-intimidating writing style that emphasizes concepts rather than formulas, this uniquely welcoming text shows consumers of research how to read, understand, and critically evaluate the statistical information and research results contained in technical research reports. Some key topics covered in this thoroughly revised text include: descriptive statistics, correlation, reliability and validity, estimation, h hypothesis testing, t-tests, ANOVA, ANCOVA, regression, multivariate analysis, factor analysis, and structural equation modeling (SEM). A number of mini-topics related to research and statistics are also discussed, such as the geometric mean, Tau-b correlation, Guttman split-half reliability, sensitivity, specificity, and the Sobel test. Additionally, the sixth edition also includes over 488 new excerpts (tables, figures, passages of text) taken from current research reports. Written specifically for students in non-thesis Master’s Programs but also perfectly suitable for students in upper-level undergraduate statistics courses, doctoral students who must conduct dissertation research, and independent researchers who want a better handle on how to decipher and critique statistically-based research reports. Thoroughly updated and revised to reflect advances in the field, Reading Statistics and Research, Sixth Edition gives consumers of research exactly what they are seeking in this caliber of text, that being the knowledge necessary to better understand research and statistics, and the confidence and ability to ultimately decipher and critique research reports on their own.